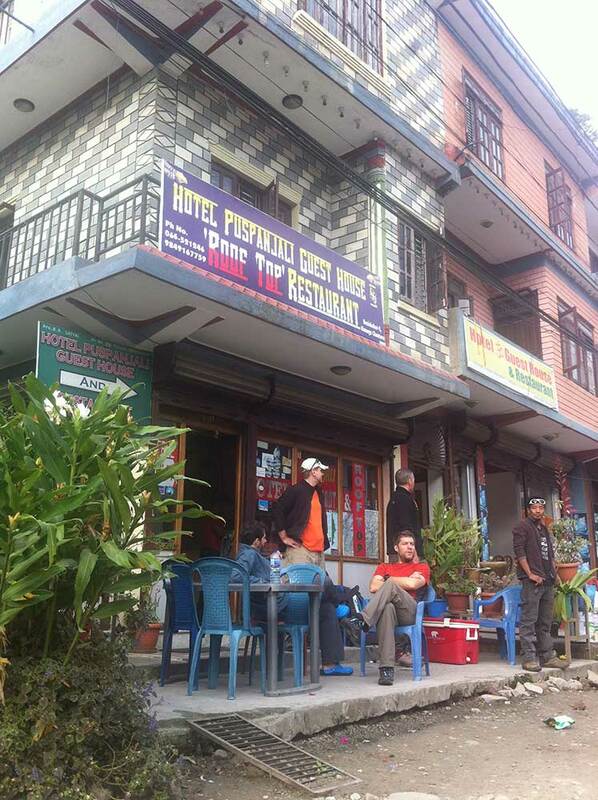 The team has just had it’s first full day enjoying the sights and sounds of Kathmandu – our area was relatively untouched by the earthquakes – and it seems the tourist area stood up well. We have completed final preparations, administration and shopping and will be leaving for Besisahar in the morning. 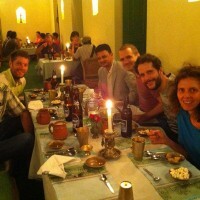 Tonight we enjoyed a traditional Nepal evening with food, music and dancers and the copious food was thoroughly enjoyed! 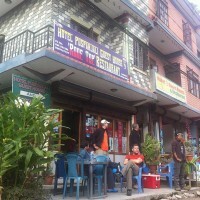 We are just about to leave Bisishahar in a jeep which will take us up to Koto which is 2000m higher than here! We are currently relaxing outside our lodge waiting for the jeep. Reflecting on the fact it’s 6 months today since the first major earthquake in April. 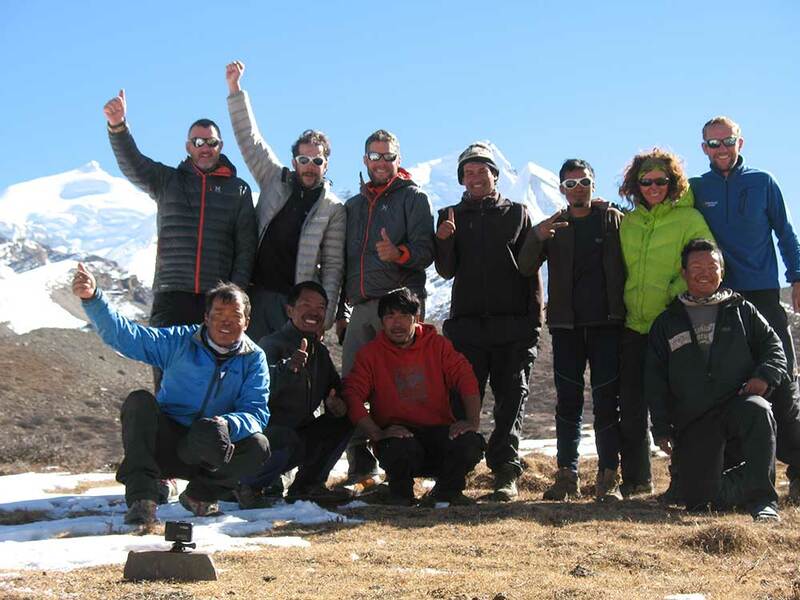 We had 3 days fantastic trekking from Koto up to Phu – great weather, spectacular views and very quiet trails – we all agreed it was some of the best trekking ever! We have now been at BC for 2 days – we had our Puja ceremony yesterday with 2 local monks, so we are now blessed by the mountain gods. Today 31st, we made our first trip to Camp 1 – an exciting roped descent onto the glacier followed by a kilometer of ups and downs over the moraine covered ice. The mountain scenery was second to non with incredible views all round. Around 30cm of snow has fallen in the last 48 hrs and this now reflected the powerful sun onto us as we climbed up the long slopes to Camp 1. 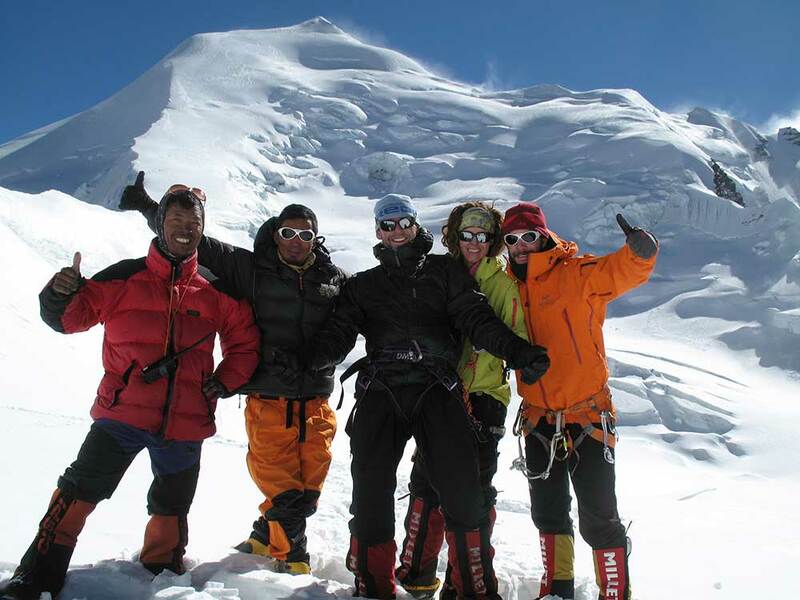 Xavier broke his altitude record with his arrival at 5500m and the team were thrilled with the achievement of attaining the first milestone of the expedition. The descent back to the glacier on soft snow was rapid and fun, despite the scorching sun! A well earned rest day awaits tomorrow. During our last rest day we sadly had to say goodbye to Patrick who decided to return to Kathmandu the fast way…by helicopter! Our benefit was a delivery of fresh vegetables, bacon and chicken! 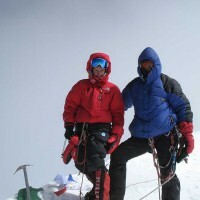 On 2 Nov we again left Base Camp to climb to Camp 1 – this time to sleep. Despite heavier backpacks we actually arrived at Camp One 30 min faster than the first time…a testament to the process of acclimatisation! The experience of collecting snow for drinking and cooking was new for some as was the amazing reduction in volume as snow melts to water. Sleeping at 5500m was not a problem at all for some – the sound of snoring drifting across the mountain could be heard minutes after we all settled! The task for Nov 3 was to climb steep rocky slopes to the hanging glacier above C1 which would lead to the snowy plateau of C2 (6100m). Again we had perfect (if a little too hot on the glacier) conditions as we ascended the dramatic ground with incredible views stretching across to Annapurna I and Manaslu – 2 of the 8000m+ giants, towering above the Himalayan skyline. Roped up together, we climbed steeply onto the glacier, weaving an intricate route under ice towers and over narrow icy crests, with the occasional daring leap over a crevasse. 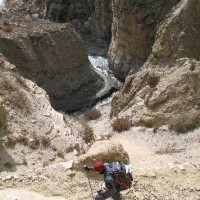 The difficulties soon eased and the trail in the snow led us onto more gentle slopes as the sun continued to beat down – every inch of skin had to be covered to stay comfortable. 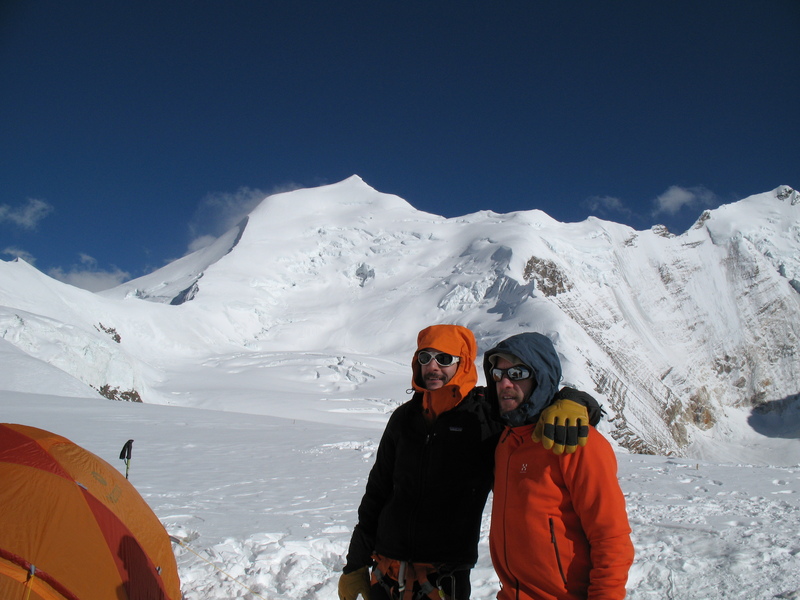 Arriving at C2 (6100m) our tireless Sherpa team had 4 tents already set up and hot juice waiting. After regaining a sensible breathing rate, we were treated to wonderful views in 360 degrees, including our first close view of the route to the summit of Himlung – 1026m above. The temperature soon began to drop and having shoveled snow into our tent porches to supply our cooking needs, we all wriggled into our sleeping bags for the night. We awoke early, with varying amounts of sleep and the familiar layer of ice crystals coating the inside of the tents and a virtual layer of snow within 20cm of our mouths on the outside of our sleeping bags- a great indication of the insulating power of down. When the sun finally hit the tents, we mobilised and packed our sleeping bags, ready for the long descent back to BC. 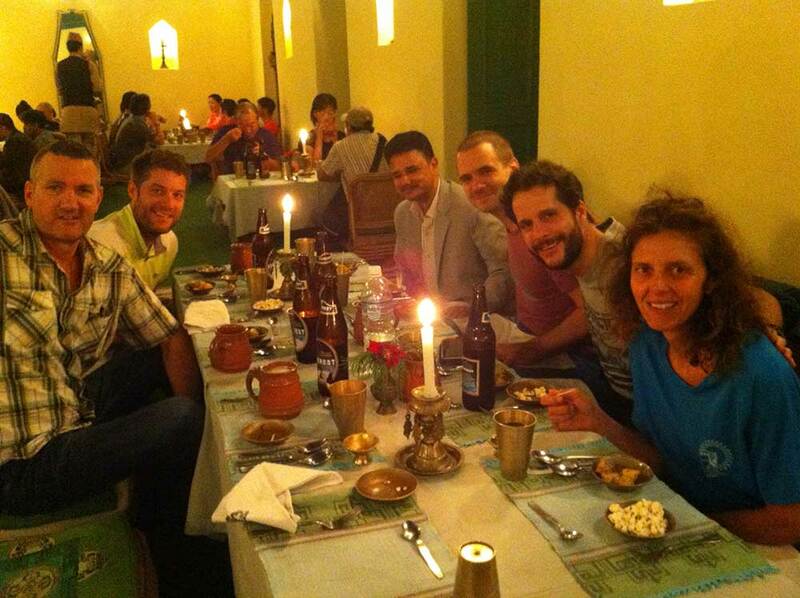 Hot juice awaited the team on return and for those with sufficient motivation, a hot shower … yes even at 4900m!! 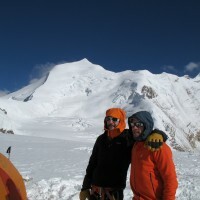 Ben celebrated a big birthday today (5/11) and spent it in the comparative luxury of Base Camp. Xavier produced a bottle of wine for dinner and the leader granted approval for its consumption at altitude! Our team Set off from Camp Three but 2 turned back early on due to extremely cold and windy conditions on the way up! 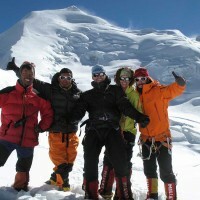 However, the remaining team members battled on to reach the summit at 11.45!!! More updates soon. 12th November – Back at BC now after a successful summit! The team left for C1 on the 7th minus their leader who was suffering stomach problems!! The forecast looked settled yet very cold for at least 5 days. Up to C2 on the 8th for the group and Chris left BC early with Phurba and Lhakpa aiming to go direct to C2! They set a blistering pace and I had to use all my willpower to stick with them – first time to C1 was 5 hours…this time we were there in 2!! A brief stop for water then onward. We caught the team up at the glacier and like a water skier I was towed upward by Phurba/Lhakpa at high speed through the seracs and crevasses and on over the rolling slopes to C2… a 2 day climb in 5.5 hours! Getting to C3 on the 9th was a short yet spectacular trip along a glacial shelf to near the base of Himlung itself. 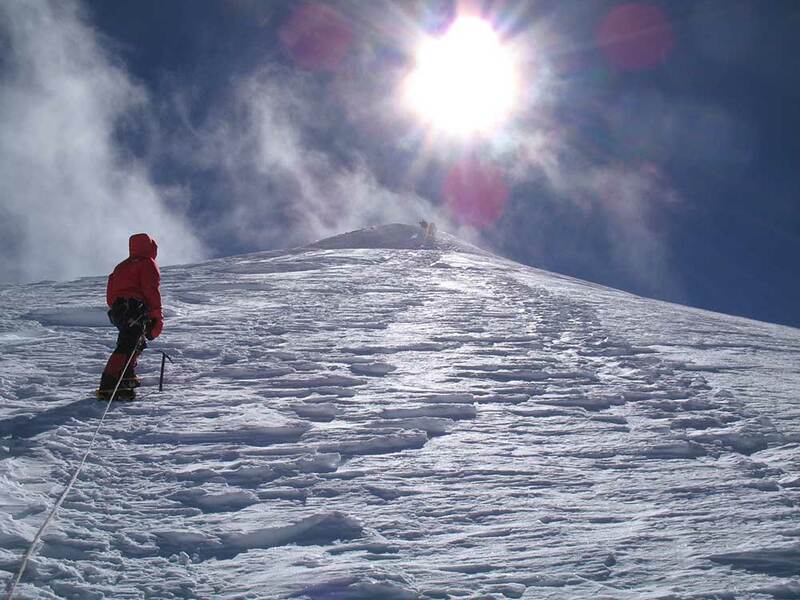 We could see the 2 tiny specks of the sherpas fixing ropes way above – the scale of the summit climb was daunting. We settled early in anticipation of a midnight alarm – half a night sleep would have to suffice tonight! Awaking to the usual dense coating of rime ice on the inside of the tents, we would take an hour to prepare hot drinks, dress and even in some cases have noodles for breakfast! The air was still,yet bitterly cold (perhaps -20C) and the team quickly donned harnesses, crampons and checked gear, by headtorch. Then roped up and disappeared off in to the darkness to the bottom of the fixed ropes. A rude awakening lay above… the steepest and iciest section of the whole climb was the first 150m! 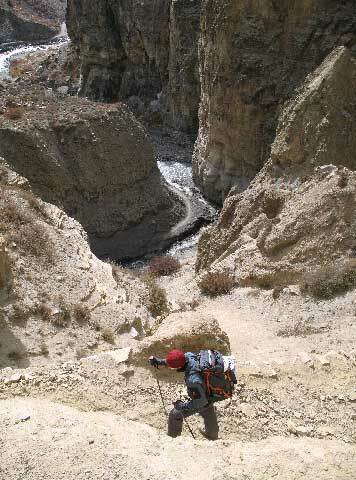 Our limbs and lungs told us we were climbing steep, hard ice at 6300m at 2.30am! 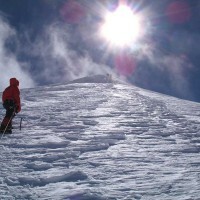 We immediately seemed to ascend into a band of wind which would be flowing over us for the rest of the climb. The cold was brutal and relentless. 2 of the team wisely decided to turn round and return to C3 while the rest of us soldiered upward in the dark, ever aware of maintaining sensation in our extremities. 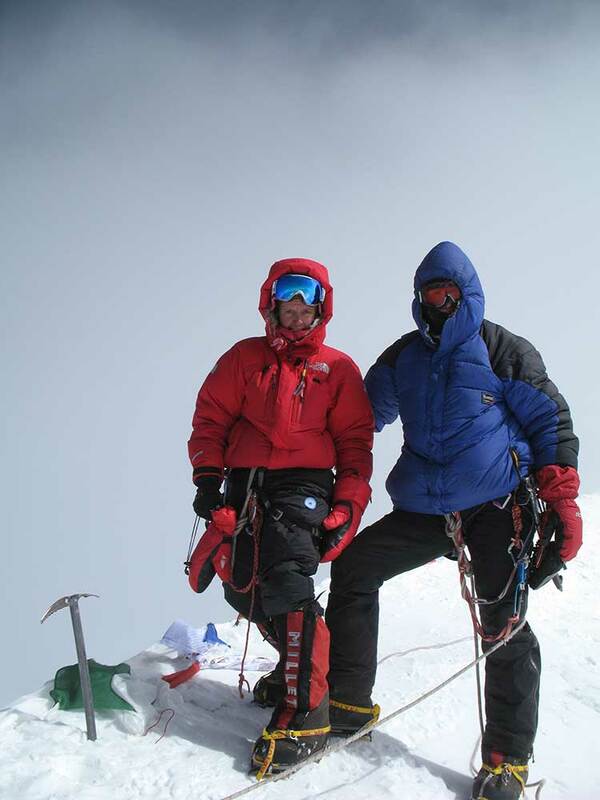 Even with 8000m boots we all had very cold toes which needed constant flexing to ensure circulation. Huge down mittens with hand warmers creating warmth within gave great comfort to the fingers, which worked hard pulling the jumar and gripping the iceaxe. Meter by meter we kicked upwards, yearning for the sun to rise to give a sense of progress. Checking the time was an impossible task, our watches buried deep inside the protective cover of down sleeves and mittens – warm hands were near the top of our simple hierachy of needs – knowing how long till lights on, near the bottom! Imperceivably, the light filtered through frosty goggles lenses and the occasional glimpse under the shoulder told us of our progress – the camp 3 tents looked very small… good. The slopes above however, looked eternal. Like ants we struggled on, our rhythm broken only by the anchor points of the fixed ropes. Safety sling clipped smoothly to the section above, then jumar slickly released and hooked round the upper rope… if only that were true! Thick mitttens makes the process a test of great patience, concentration and precision despite a good deal of practise earlier at basecamp! Finally the sun rose, yet the westerly aspect of Himlung’s face meant we climbed in the shade, despite every peak around us being bathed in glorious sunshine. We’d already calculated it would be around 9.30am before the sun shone directly on us. When it finally did, the relentless cold wind maintained the upper hand and continuous motion was required to maintain a semblance of warmth. The angle eased and we roped together for the final 200m to the summit, snow blew wildly round the summit cone above, yet its proximity drew us magnetically upward. The last 20m gave a good fight with steep snow, but all of a sudden we were there… no more uphill! Hugs and muffled congratulations all round and attempts at photography and even video. 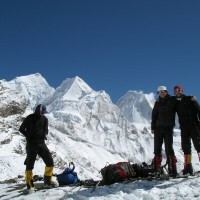 Views across to the Annapurnas, Dhaulagiri and Machhapuchhre – absolutely crystal clear! Descendng was so fast on smooth snow slopes, clipped in with hand gripping rope. 2 hours saw us just above the abseil down the icy walls to the shelf of C3. The joy of warm bodies and feet kept us going as the meters flew by. The final traverse to the tents was a test of determination which took far longer than it should, yet we had time to sit and enjoy the views and a great sense of achievement. We celebrated with plenty of hot drinks and our favourte high altitude food, Chinese noodle soup…joy! We all arrived back at BC tired and proud. Showers, great food, thick mattress and our own tent rewarded us. And no more melting blocks of snow for every meal / drink! 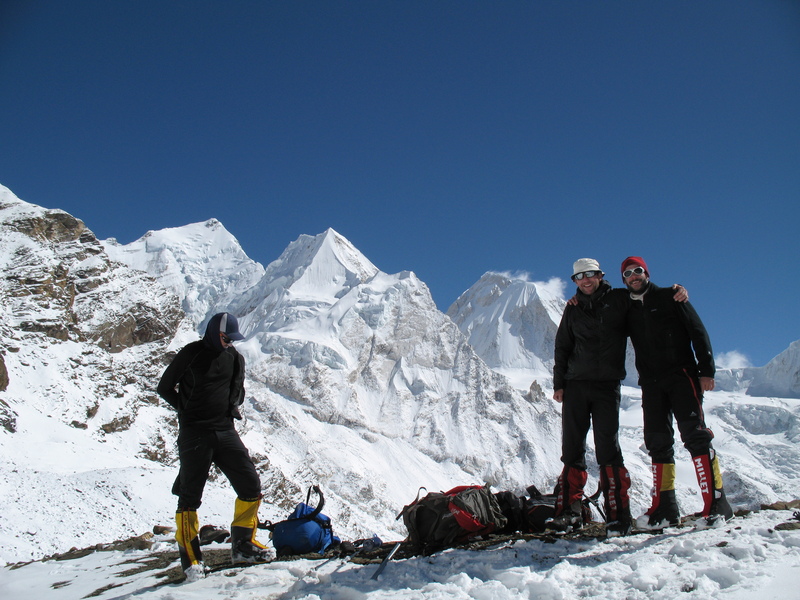 View our 2016 dates for Himlung Himal and save up to £150 with our early booking discounts. Bon anniversaire mon Bicounet chéri, je pense à toi très très fort. Tu as choisi un des plus beaux endroits au monde pour fêter cet évènement. J’espère qu’il fera beau et que le soleil des cimes et la neige te combleront demain. Je suis heureuse de savoir que tout va bien, que vous avez eu des journées magnifiques et vécu des expériences formidables : tout ce que tu attendais ! Je prie pour que tout continue ainsi et que vous alliez d’émerveillement en émerveillement. Bravo à Xavier pour sa nouvelle étape d’alpinisme. Je suis contente de savoir que demain et après-demain, si le programme reste le même, vous vous reposiez, ainsi pour ton anniversaire tu pourras juste profiter de tes amis et compagnons d’expédition et de la beauté des paysages. Je fais plein de voeux pour que tu sois particulièrement heureux demain et que cette nouvelle expérience t’aide à trouver le chemin et le sens de ta vie. Je t’embrasse de tout mon coeur de maman qui t’aime tendrement et pense au bonheur de ce jour béni du 5 novembre 1975. Que Dieu te garde, je suis contente que vous ayez été bénis par les moines, ainsi vous êtes protégés, et, je l’espère, inspirés. Maman qui t’aime. BON ANNIVERSAIRE. Nous allons tous bien et avons passé deux semaines très agréables à LB, seuls puis avec les Burel et Delphine, un temps très doux et ensoleillé à mi temps. Cam a eu hélas des problèmes dentaires qui l’ont dérangée mais tout va bien maintenant, les garçons ont fait un stage de tennis de 10h à 16h toute la semaine et Garance a profité de sa maman et de son papa sans rien faire…C’était important pour elle. Delph a plein de RV qui l’intéressent beaucoup et elle est ravie de retrouver des gens qu’elle n’avait plus vus depuis longtemps. Mille pensées et baisers tendres. Thank you to all of you. It was a really nice pleasure to met you. It was a nice and friendly team with a good leader full of patience….!! !